Perth Airport bosses have begun looking into the possibility of running scheduled passenger flights. ACS Aviation director Craig McDonald said attracting airlines like Easyjet or Ryanair could be "great", but was more of a long-term ambition. His comments came after the company said it was on course to report a 46% increase in turnover for 2018-19. 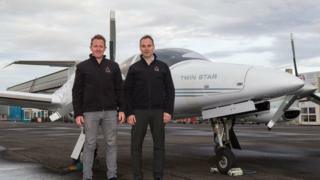 It has seen strong growth in its flight school, and it also has a business servicing planes. The company is forecasting turnover for the year ending 31 March to increase from £1.3m to £1.9m. Its aviation school has also been given the green light by the Ministry of Defence to train military pilots for careers flying passenger planes. The programme allows them to gain Enhanced Learning Credits, so that qualifications can be converted to civilian licences. Mr McDonald told BBC Radio's Good Morning Scotland the school was almost fully booked for the next nine months, and he expected more than 200 students to graduate in the next two to three years. "Since we took over in 2016 we've invested a significant amount of money into the business - over £1m," he said. "We've recruited a number of flying instructors and now we've got record numbers coming through the school." ACS Aviation also carries out full maintenance work on smaller planes, like the Diamond DA20 and DA40. "The aircraft that we maintain are smaller aeroplanes," said Mr McDonald. He added: "Luckily for us most of the small aircraft fly in and out of there - aircraft involved in aerial survey, skydiving aeroplanes and our own fleet as well." When asked if Perth Airport had plans to attract scheduled passenger flights, Mr McDonald said: "Not at this time, but it would be great if we could go down that road. "At the moment the airport doesn't have what we need as far as approach procedures are concerned, but we are now looking into that." He added: "Perth Airport does have good transport links. "It's three miles north east of Perth city centre, so it's well located in Scotland and central to Glasgow, Edinburgh and Aberdeen so I reckon there is a market for that." Follow BBC presenter Andrew Black's business updates each weekday morning on BBC Radio Scotland's Good Morning Scotland programme between 0600 and 0900.